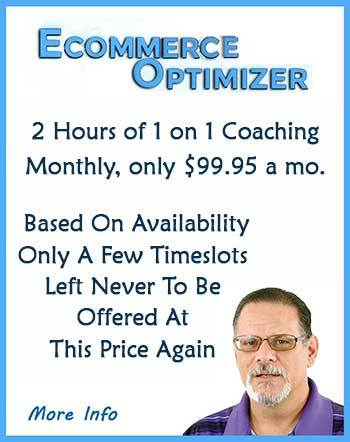 The driving purpose behind Ecommerce Optimizer is the desire to help businesses of all sizes succeed on the internet. E-commerce is still an expanding frontier of constantly changing variables. Companies of any size can openly compete in areas once reserved for businesses with the deepest of pockets. Ecommerce Optimizer is made up of a group of professionals considered subject experts, spread all around the world. Together they form the team behind creator and founder Joe Reichsfeld. Joe is an E-commerce consultant, mentor, and marketer with 40 years of solid business experience in many different areas both online and off-line. Together, they have applied their expertise to assist many businesses in dominating niches, expanding into multiple varied markets while becoming sector leaders. His success in business before the internet combined with over 18 years of E-commerce and Internet marketing, gives him a unique perspective and at times unconventional approach. He focuses clients on mastering the fundamentals, mining the value hidden in data, monetizing under-utilized strengths and automation. The detailed direction he contributes combined with his no-nonsense approach and ability to enable a business to become a disruptive driving force are highly sought after by business people from sole proprietors to CEO's of very well known brands. As a single parent, Joe had his hands full raising his sons but they made it to adulthood and Joe managed to survive.. Outside of work he donates time to teach others about technology and how to use it, efficiently accomplishing what they are seeking. He loves the outdoors, enjoys spending time with his sons, exploring Arizona's secrets and woodworking. Joes' focus has remained the same. Take advantage of technology, data, and his experience assisting business growth and profitability to help others. The close of 2018 brings a new direction for Joe and the Ecommerce Optimizer Team. The commitment to assisting business growth and sharing of knowledge continues to mature. Ecommerce Optimizer is going to change the current webinar model that sellers follow for learning, offering a better alternative. How many notes can you take in 3 days? How much do you clearly retain and apply? Ecommerce Optimizer will offer learn at your own pace workshops, available to you all of the time, learning and reviewing at your own pace with a very low monthly membership. It will take the average sellers years to spends what they now spend on one seminar. Stay Tuned... our first set of Workshops will be a set of 50 workshops, each focusing on a different method of driving traffic to your site or listings.